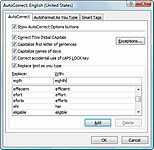 Excel 2007’s AutoCorrect feature already knows to automatically fix two initial capital letters in an entry, to capitalize the names of the days of the week, and to replace a set number of text entries and typos with particular substitute text. But you can use AutoCorrect to alert Excel to your own particular typing errors and tell the program how it should automatically fix them for you. 1Click the Office button and then click the Excel Options button. The Proofing options appear in the right pane. 3Click the AutoCorrect Options button. 4Select the Replace Text as You Type check box. This check box is usually selected by default. 5On the AutoCorrect tab, enter the typo in the Replace text box. You also can enter an abbreviation here. 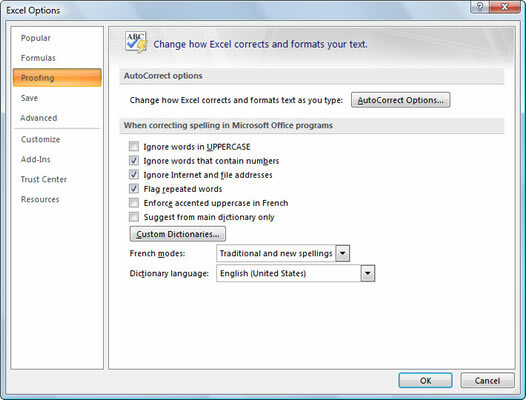 Be sure that the text you type in the Replace box of the AutoCorrect dialog box isn’t a real word! Otherwise, you may unintentionally replace a commonly known word with other unwanted text. 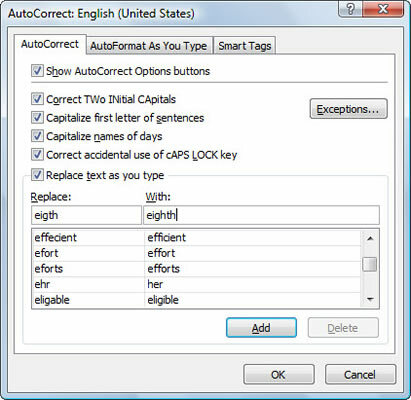 6Enter the correction in the With text box. 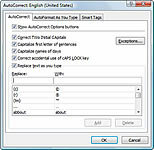 If you entered an abbreviation in the previous step, enter the full form of the text here. 7Click the Add button and then click OK two times. 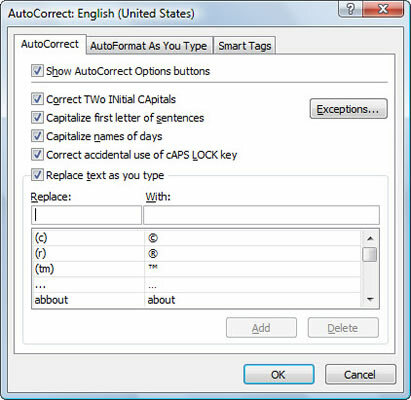 The new typo or abbreviation appears in the AutoCorrect list, and both dialog boxes close.